The temperature here at Meadow Glenn was 38°F. this morning. I thought there were frost crystals on the roof of our house, but there were no pockets of frosty grass in the low spots of our lawn. The leaves of the super-sensitive basil in our garden remain bright green, not the drooping black they would be if frost had kissed them good-bye. Today is October 23, and the 10-day forecast on Weather.Com lists the lowest temperature as 42°F. Isn’t our first freeze overdue? The short answer is, “Yes,” but other than from daily observation and recording of temperatures, which I haven’t done, where can I find out when the first freeze will be in the fall and the last freeze will be in the spring in our neighborhood? I read their article with increasing interest and began following highlighted links. One spreadsheet, “List of locations included in the contour map,” contained first-freeze dates for 58 locations here in Maryland—and eight in Delaware, three in New Jersey, three in Pennsylvania, 72 in Virginia, and 18 in West Virginia. I skimmed down the Maryland list and found Clarksville and Brighton Dam, both of which are about three miles from our home. The compilation says the average first-freeze date for both locations is October 12. Since today is October 23, yes, our first freeze is late this year. 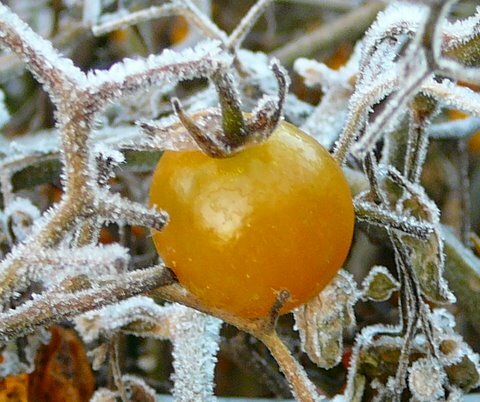 I’d like to add another complication: First-frost may come before first-freeze. How can that be? 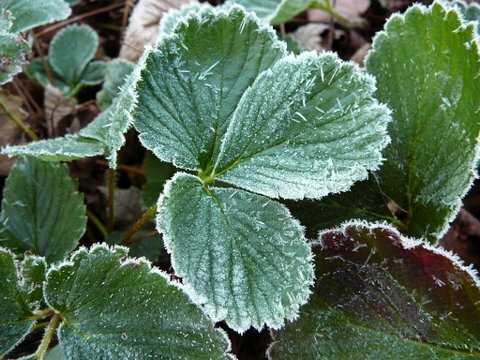 I noticed several years ago that frost often forms in our garden when the official temperature is above freezing by a degree or two. When I researched that issue, I found that the thermometers used to officially record temperatures generally are located about six feet above ground. Under certain conditions, the temperature at ground level can be freezing while the official temperature is slightly warmer just a few feet above. Now it’s time for you to explore. To link to the Capital Weather Gang’s posting, CLICK HERE. To link to the Utah State University site to check out spring and fall freeze dates for your town, CLICK HERE. I suggest some caution when using the data on the Utah site. Some of this reported data does not make sense- e.g., a reporting station in Frederick has the same last spring freeze date as Grantsville; some nearby locations have very different readings. And the time periods for the recorded temperature are different for each location.